The Resource Conservation District of Tehama County (RCDTC) is passionate about water conservation. The district, located at the north-most part of the Sacramento Valley, is mainly forest and agricultural land, with the Sacramento River running bisecting the county west and east. Locals and visitors alike value the open space and wide vistas of Tehama Counties diverse landscapes. Many of their programs like the Mobile Irrigation Lab focus on agricultural use, but they also connect with residents who are interested in using water wisely through events like their rainwater catchment workshop. A wet winter after an unusually hot summer contributed to high community interest when RCDTC held a rainwater catchment workshop in Red Bluff. 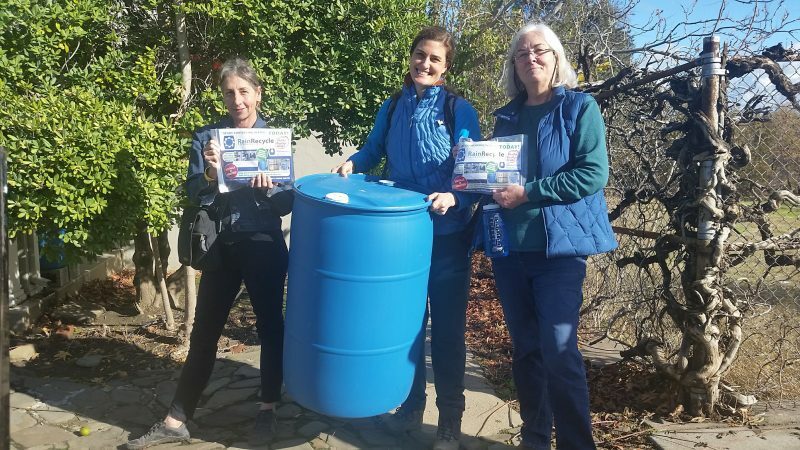 The workshop, hosted in partnership with Butte Environmental Council, provided attendees with their own 55 gallon plastic drums along with kits to convert them. Attendees learned how to capture water flowing off their roof by using their conversion kit to divert rainwater from the downspout directly into the barrel. Going hand in hand with the theme of conservation, the plastic drums, which are commonly used in juice and olive oil production, were upcycled from local agriculture and food processing facilities. The workshop was a hit, and the RCD hopes to host one again. RCDTC provides free irrigation evaluations to farmers through their Mobile Irrigation Lab (MIL). This program was started in 2002 and currently has performed evaluations on 1,028 irrigation systems. To perform an evaluation, Kevin Greer, who has working with the Lab since 2009, will schedule a visit with growers and perform a full audit of all portions of the irrigation system. 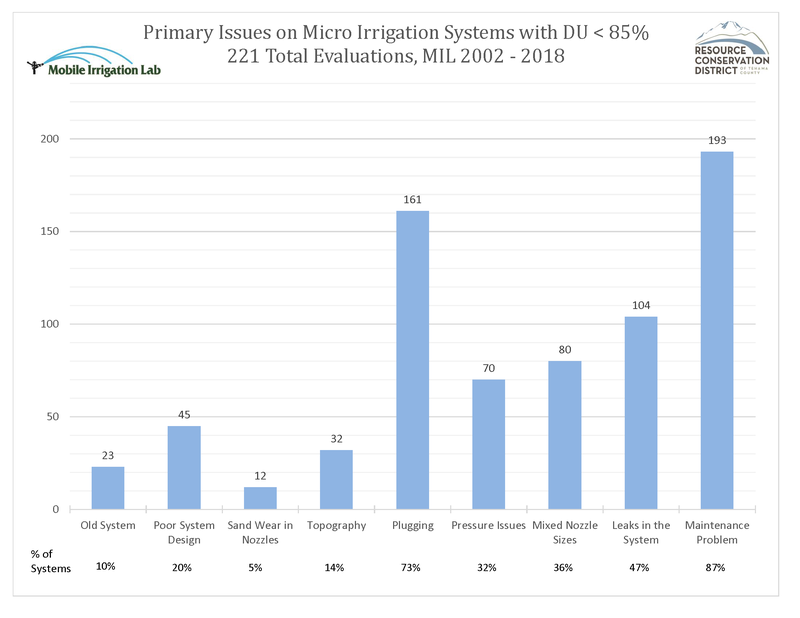 The two key pieces of information the MIL provides to the grower are, the rate of water being applied to a crop (application rate in inches per hour), and the overall distribution uniformity (DU) of the irrigation system. The goal of the MIL is to give growers an overall snapshot of their irrigation system, provide scheduling information, and give recommendations to help improve efficiency. 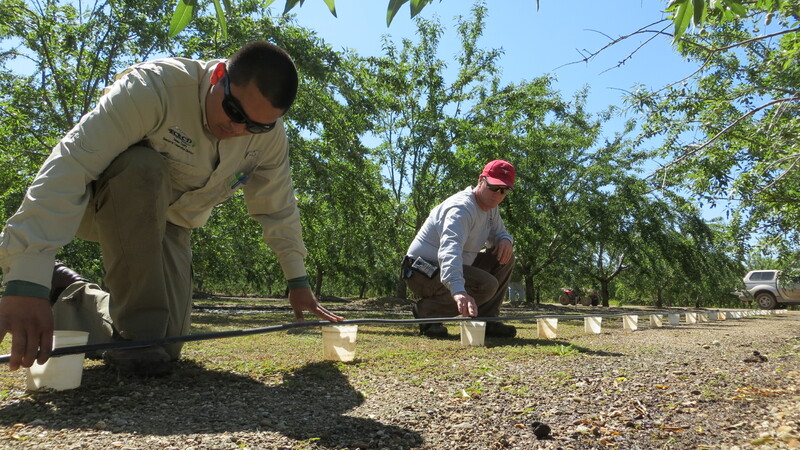 RCD staff and a student intern from Shasta College test the drip tape emitters for a Mobile Irrigation Lab evaluation. They will use the data to calculate the distribution uniformity and the application rate, which will inform the farmer on how often to irrigate and what maintenance to complete. One of the common recommendations made by the MIL relates to issues associated with maintenance. Micro systems, (sprinklers and drip) are prone to plugging and leaking, and depending on the severity, cause significant decreases in uniformity. There are numerous reasons why a system may have plugs or leaks, including; debris in the lines, calcium and/or bacteria buildup, animal damage, clogged inlet screens and many other possibilities. Once the locations and causes for these issues are determined, the MIL can then recommend appropriate solutions to the grower. Another key component to the MIL is assistance for scheduling irrigation events. There are several different ways to determine how much to irrigate any given crop and the main one used by Kevin in his MIL reports is based on the concept of evapotranspiration (ET) rates. In order for a grower to determine how much moisture the crop and soil are using, they can refer to the UC Cooperative Extension’s Weekly Soil Moisture Loss Report which provides localized ET rates that can be used in combination with the DU and application rate calculations taken by the MIL. This information is included with each MIL report and can aid in growers ability to apply and adhere to efficient irrigation scheduling practices. The MIL is part of the RCD of Tehama County and is located in the northern Sacramento Valley based in Red Bluff. 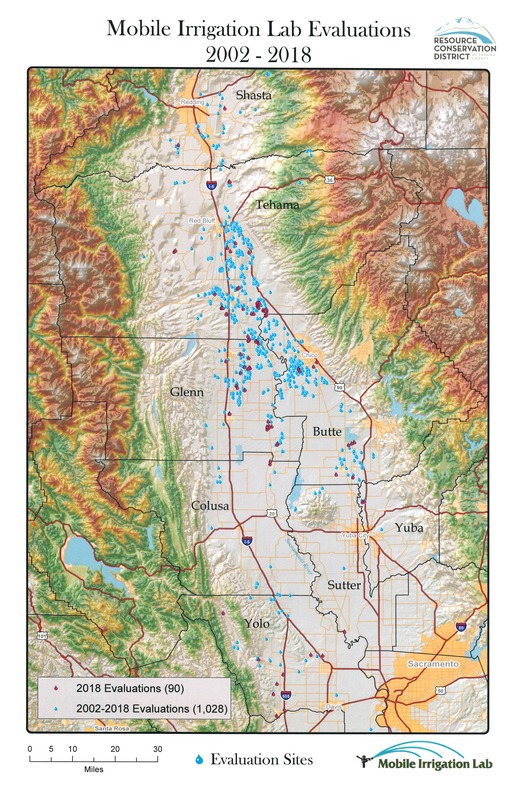 And the MIL is indeed true to its name as they have performed evaluations in 9 counties between Yolo in the south, Siskyou to the north and Lassen to the east. The MIL does regularly travel up and down Northern California servicing mainly Tehama, Shasta, Butte and Glenn Counties. But this service is also available through different grant opportunities and as a fee for service in most counties north of Sacramento. The MIL can also evaluate any kind of irrigation system but due to the type of agriculture most common in their service area (almonds, walnuts, olives and prunes) they most commonly work on pressurized solid set under-tree systems and micro. The Lab is a seasonal program, and runs during the peak irrigation season, typically between late April and early October. Requests for evaluations tend to taper in August due to the harvest period, and once the rainy season starts most growers do not want to turn their pumps on due to high pumping costs in addition to poor accessibility into the fields and orchards. Kevin and his MIL do about 90 evaluations a year and he has completed over 800 in his time at the RCD. In total, the lab has evaluated 38,452 acres and performed 1,028 evaluations in 9 counties between 2002 and 2018. Over time the value and demand for the MIL has continued to grow as water conditions in California are continually changing and increased pressure is applied to the water supply. As a result Kevin is hopeful that the MIL will be around for years to come, continuing to assist growers with the MIL program for all of their irrigation requirements. The RCD has many more water conservation initiatives. They are eager to connect with their wider community outside of a strict agriculture and habitat context and to engage with partners who share similar goals. To stay connected with RCD of Tehama County, visit their website and like their Facebook page. Speakers: The RCD hosted “Drought Busters” (the water conservation version of Myth Busters) speaker series to see if any of the drought myths “hold water” where they invited the local television weatherman, a climate science communicator who hosts the “Blue Dot Report” on the local NPR station, a specialist on native plants, RCD staffer Kevin Greer, and a Department of Water Resources specialist. They hosted a Conservation Conversation to engage the community on the Sacramento watershed. Their latest Wild and Scenic Film Festival showcased a variety of short films on conservation topics like watersheds and habitats. Habitat enhancement and water storage: The Leininger Ranch Stock Pond and Spring Development Project was an enhancement project to turn ponds used to water livestock on ranches into viable habitat and increase their storage capacity. SWEEP funding technical assistance: Earlier this year they gave technical assistance to producers looking to apply for SWEEP funding. This included workshops and one-on-one technical assistance.